You can see the problem below. Does anybody knows how this can happen. Can I reinstall the firmware? Or something else? Can you move the head around reasonably easy by hand? Have you oiled the shafts etc.? Checked your speed settings in your slicer? It doesn't hurt to reinstall your firmware. I think I just discovered the problem during your maintenance tip. One of the pulley's was loose. It's rare to shift in X *and* Y at the same time but possible. I would first tighten the tiny set screws on all the pulleys. I believe there are 6 for each axis. The most likely are the 2 pulleys for each axis on the short belts (motors). 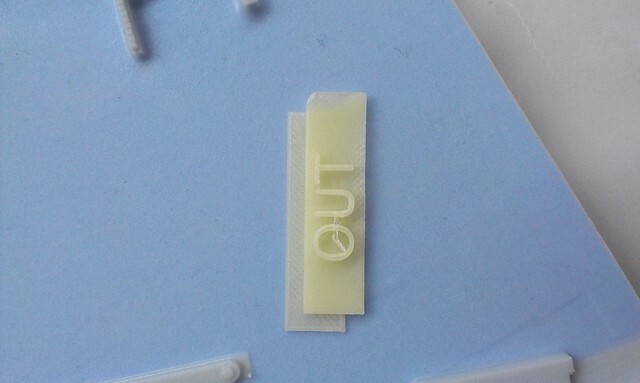 However is it possible that your part came loose during printing? Was it still stuck to the bed when the print was finished? If not then you can improve the stickiness of the blue painters tape by rubbing it with isopropyl alcohol. This will increase adhesion by about 100X. Someone else had a very similar problem this week and claims they fixed it by re-installing the firmware (using cura of course). This seems bizarre but their experiment was repeatable. At the moment it seems to be that the loose pulley was causing my problem. The part did not come loose during the printing. I'm going to try your tip with the isopropyl alcohol.